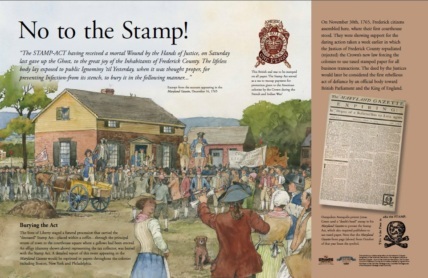 In 1765, British Parliament imposed the Stamp Act on all 13 colonies. Under the Stamp Act it was mandatory for colonists to pay a direct tax and it required many printed materials like legal documents, magazines, playing cards, newspapers, and many other types of paper to be produced on stamped paper produced in London, carrying an embossed revenue stamp. The tax was meant to help pay for British troops stationed in North America. The Stamp Act was extremely unpopular among the colonists, including those in Frederick County. They did not wish to be taxed without their consent. The slogan “no taxation without representation” resulted and there were petitions, protests, and demonstrations against it. Twelve Frederick County judges met at a house on Record Street, behind the current City Hall, and decided they were not going to charge the tax. The official stamps had not arrived from Britain and they felt the colonists had not been properly notified. A proclamation was passed by the judges and the Maryland Provincial Assembly. These 12 judges were the first in America to repudiate the Stamp Act. In 1904, a plaque was placed by the Frederick Chapter of the Daughters of the American Revolution at the Frederick County Courthouse, in memory of “The Twelve Immortal Justices” who repudiated the Stamp Act. It lists the names of the twelve men: Thomas Beatty, Peter Bainbridge, William Luckett, Charles Jones, David Lynn, Thomas Price, James Dickson, William Blair, Samuel Beall, Josiah Beall, Andrew Heugh, and Joseph Smith.